Coordinates for any count of a drill can be printed, however you’ll typically only want to print coordinates for set points in the drill. 3D uses page tabs on the Count Track to determine the sets in a drill. Prior to printing, you may want to add or remove certain page tabs from the Count Track so the sets will print out according to your preference. It is useful to use sub-sets on the Count Track to indicate sets that are used for design purposes but not to print. 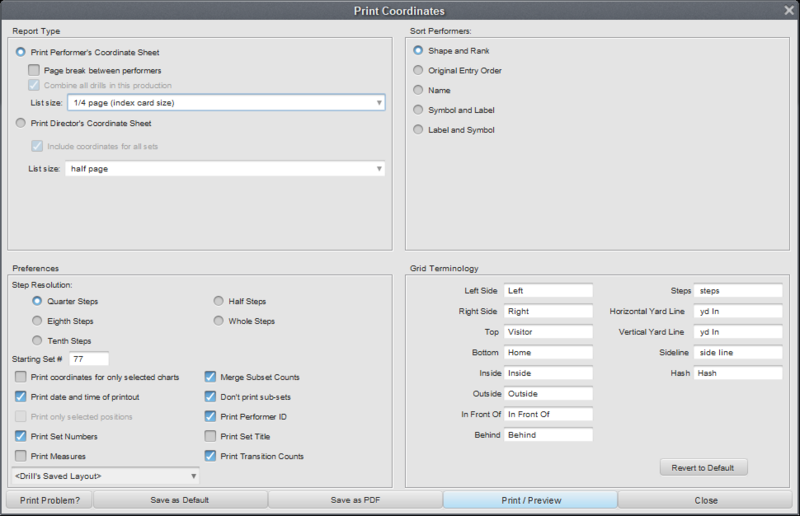 Selecting Print Coordinates from the File menu will display the Print Coordinates dialog. Print Performer’s Coordinate Sheet is a list of coordinates for a performer. 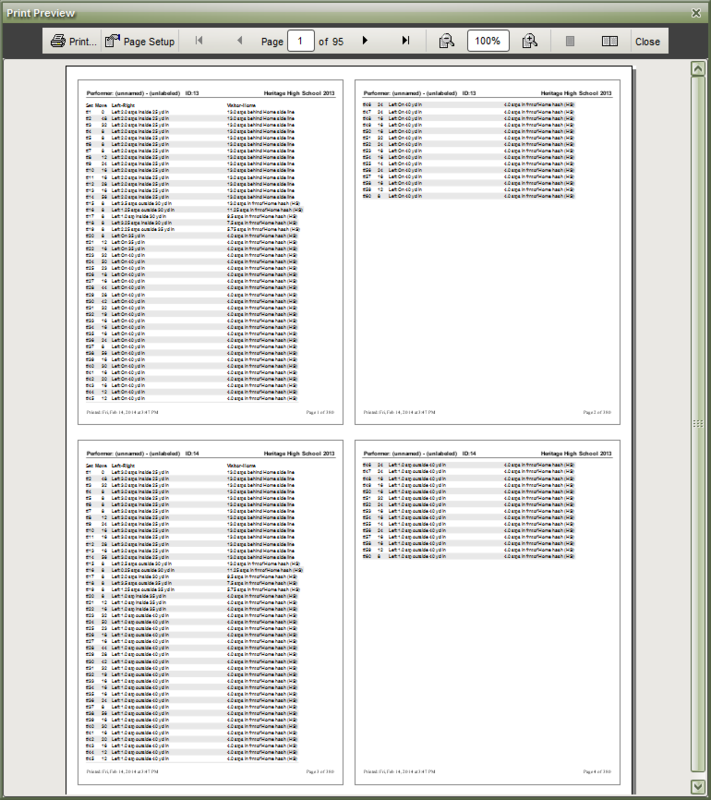 The coordinate list contains a coordinate for each page tab (set) in a drill. Combine coordinates of all drills in this production into one list is available when printing coordinates from a Production file. List Size is the size of the printout. This is useful for performers who want lists to be printed in a convenient size for fitting on index cards, or small pocket size for a wallet. Print Director Coordinate Sheet is a list of all performers. The list contains a coordinate for each performer at a page tab. A Director Coordinate Sheet can be printed for each page tab in the drill by selecting the Include coordinates for all sets option. The options found under Sort Performers will sort the coordinate list by the option you specify. Coordinates can be printed at four different step resolutions: Whole step, half step, quarter step, and eighth step. Starting Set # will change the first page tab to the value entered. All page tabs will be effected by this change. 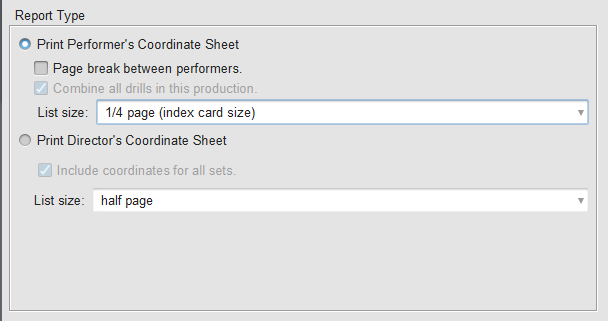 Print coordinates for only selected charts when this option is selected, coordinates will print for any selected chart in the Print Charts dialog. Print date and time of printout will print a time stamp on the coordinate printout. Print only selected positions is useful for reprinting a single performer or a group of performers. Select the performer(s) with a Selection tool before selecting Print Coordinates from the File menu. Then check the Print only selected positions option. Print Set Numbers displays a column of each set number for every set. Print Measures will add a measures column on the coordinate print out. Grid Layout Menu will allow you to quickly switch to a different grid for referencing yardlines and hashes. Don’t print sub-sets will not print sub-sets when selected. Print Performer ID will print the unique ID number that 3D has assigned to that performer. This number is different from their symbol and label. Print Set Title will print a set title (if any) for the set on the coordinate printout. Print Transition Counts adds a column for the counts from set to set. Setting up the Grid Terminology to match the terms commonly used by your ensemble will make the coordinates easier to understand by the performers. For example, on a football field grid the Left Side of the grid (the left endzone) may be referred to as Side 1 or Side A rather than the default term Left. The use custom terms for steps, yard lines, and sidelines option is useful when writing for indoor ensembles that do not have yard lines and markers to reference. Save as Default saves the settings of the Grid Terminology and Preferences as default values. Save as PDF will save the coordinates as PDF documents instead of printing a physical copy. Print/Preview opens the print preview and page setup dialog. Print will send the job to the printer. Previous Page will move to the previous preview page of the print job. Next Page will move to the next preview page of the print job. Page Setup opens the printer’s page setup dialog. Done closes the print preview and returns to the print coordinates dialog.